Not only are these the Best Baby Back Ribs in the Slow Cooker, they are absolutely the best ribs I’ve ever made, period. And some of the best baby back ribs I’ve ever tasted. These ribs fall off the bone as soon as you try to lift them out of the slow cooker. And I mean fall-of-the-bone the way you want ribs to fall off the bone. They fall apart because the meat is super moist and tender. 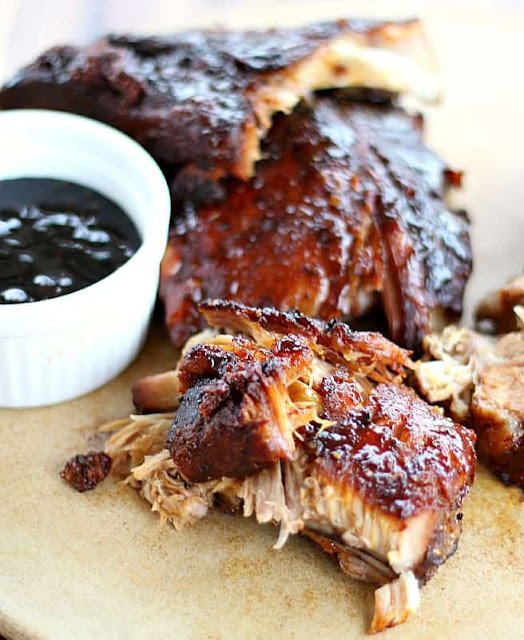 The flavor combination here is exactly what you’re looking for in delicious sticky ribs. Each bite is juicy-tender with the right balance of spicy flavor that doesn’t overpower the ribs. Some of the sauce goes in the slow cooker with the ribs and then more is brushed on the ribs after you take them out of the slow cooker. Crisp them up under the broiler for a couple of minutes more. Lay the pork ribs out on a cutting board and make sure that the membrane from underneath the ribs has been removed (most stores and butchers do remove this). Mix together all the ingredients listed above for the rub. Using your hands, massage the rub into both sides of the ribs, concentrating a bit more on the top, meaty portion of the rack. Let rest while you start the sauce. In a bowl, stir together the ginger, pepper, and onion powder. Add the garlic and mix again. Add the sweet chili sauce, soy sauce, balsamic vinegar, brown sugar and honey. Whisk to combine. Set aside. Pour about 1 1/2 cup of the sauce over the ribs and place the remaining half into a small bowl and put in the refrigerator for now. 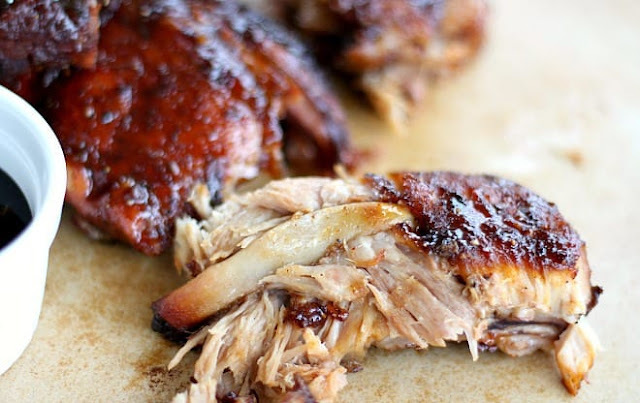 Remove the ribs from the slow cooker and place them on a tin foil lined broil pan or baking sheet, meaty side up. Remove the sauce from the refrigerator and brush a little more of the sauce on top of the ribs until nice and shiny. Leave ribs alone for a minute while you finish the sauce. Heat the saucepan to medium heat and bring the sauce to a boil. Once it starts boiling, whisk the cornstarch and water together in a small dish. Stir together and then while whisking in the saucepan, slowly drizzle in the cornstarch mixture. Whisk until it comes back to a boil and then turn to medium low and allow to simmer until it begins to reduce and thicken, about 5-8 minutes. Set aside. Place the meat under the broiler in the middle of the oven for a few minutes or until it looks sticky and broiled. Be sure to watch it carefully. Allow to rest, tented with foil for 3-5 minutes and serve with the sticky sauce on the side.